You have seen them, passed them or heard them. Some are green and others are red, there may be yellow ones too. It’s harvest time. Farmers are in their fields picking crops they have nurtured since spring. We lost our farmer in the middle of harvest. It was five years ago this Thanksgiving when the tractors were still rolling in the fields and the grain dryer was buzzing through the cold, clear night air. And to this day we still celebrate his life and we still celebrate the harvest. 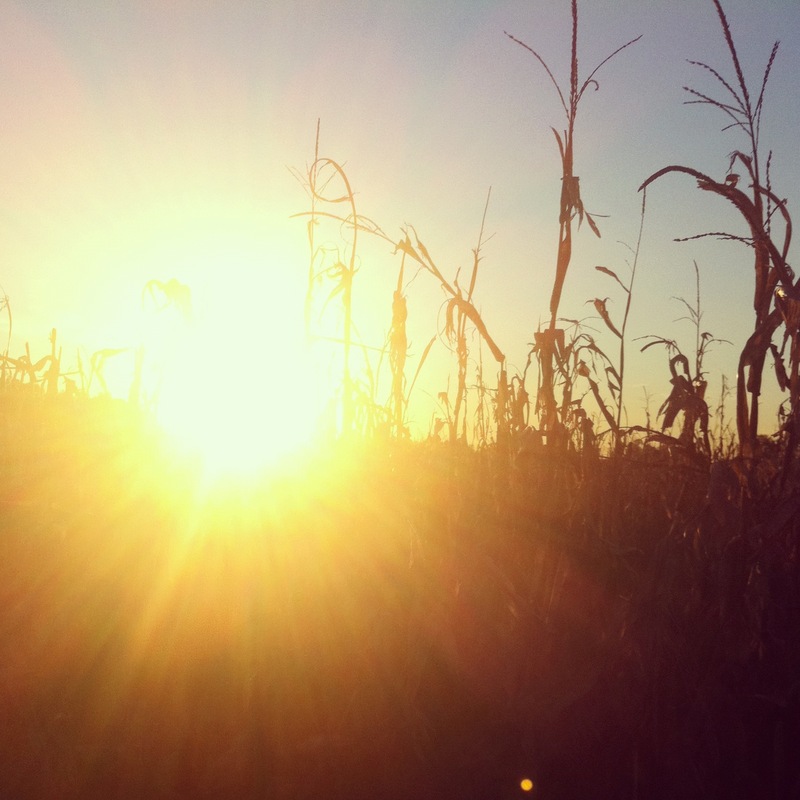 For the farmer, fall is not about pumpkin spiced flavor drinks and treats. It’s not about taking selfies by the changing leaves or who has the highest score in a fantasy football league. When those leaves begin to change farmers are making sure their equipment is working properly, scheduling loads to grain elevators and making sure their livestock has all the necessities they need for the changing season. Those monstrous machines you see in the fields and taking up much of the road and shoulder are called combine harvesters. Their job is all in the name; they harvest the crops. 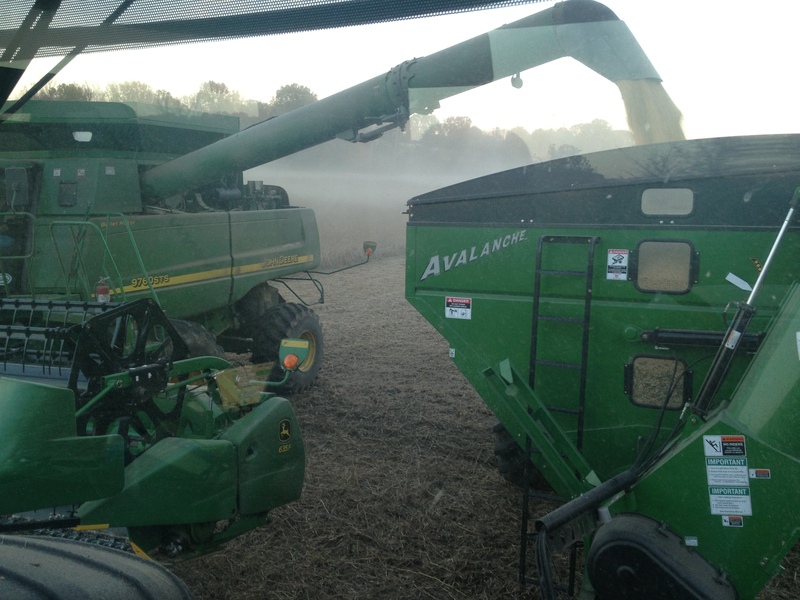 Combines are the most important piece of equipment in the fall season. You will also see tractors with a “big wagon” hitched to the back that runs alongside the combine. That wagon is actually called a grain cart. Its job is also all in the name as well. 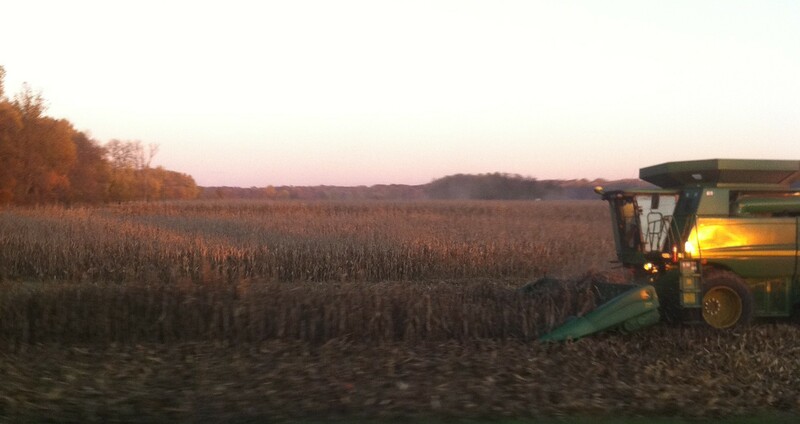 It carts grain from the combine which is harvesting the crops. And then there are semis. The grain from the grain cart is transported into the bed (back end) of the semi. The semi then gets on the road to deliver the grain to grain bins or silos back on the farm. From there, the grain bin stores and dries the grain until the farmer is ready to sell and transport it to a different destination, like a grain elevator or a livestock farm. In Indiana, our farmers have a variety of options for their corn and soybeans after the harvest. They can keep it on their farm and store in in their grain bins, they can deliver it to a country elevator by semi or a container yard for transport by train or even a barge terminal along the river for it to be sent down the Ohio River to the Mississippi and then be sent somewhere around the world, most likely China or Japan. They can load it by semi to be sent to a soybean processer to make soybean meal and oils or to an ethanol plant to make ethanol and DDGs (distillers dried grains which is used for livestock feed). In Indiana, we plant a lot of corn and soybeans with other crops being grown throughout the year including wheat, sorghum, tomatoes and other fruits and vegetables. In our state, we mainly think of harvest during the fall. However, there are so many other crops that are harvested throughout the year. Think about your garden and summer farmer’s markets. The agriculture family has stepped up our game in recent years in regards to educating consumers about where their food comes from and about the seasons in which they plant, nurture and harvest. The new documentary film “Farmland” follows several young farmers from around our country and highlights the various faces of farming and what the future of agriculture looks like. One farmer featured is a cattle rancher in Texas while another is an organic farmer in California and yet another poultry farmer in Georgia. All very different but all farmers working in agriculture with harvests that occur throughout the year. You can now watch “Farmland” on Hulu and step foot on these farms and ranches to learn more about agriculture and be a part of their harvest. As our Indiana farmers are in the thick of harvest and the month of November is a time to gather around the table with family and friends to celebrate, remember to give thanks for the food on your table. Give thanks for those that planted it, nurtured it, harvested it, took time away from their families to provide it for you and may have lost their lives when the combine was still rolling. Give thanks for the old farmers, the young farmers and the future farmers. Give thanks for the harvest because you are a part of it too.